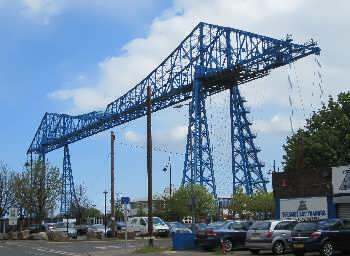 Spanning the River Tees at Middlesbrough, this fine transporter bridge is actually the largest of its kind still in operation anywhere in the world. The construction of this kind of "bridge" is very unusual is that cars and foot passengers are carried across on a special platform (called a gondola), which is suspended by steel cables from a much higher cantilever spanning towers on either side of the river. The design allows clearance for large ships when the gondola is parked at either side of the river, and in this respect the transporter bridge functions in a similar way to the ferry which it replaced when it was opened to the public back in 1910.